Prague is an ancient crossroads of culture, one of the most beautiful cities in Europe, and still a little off the beaten path for many. Prague’s cobblestoned streets, lined with colorful and ornate 19th century buildings, will lead you to countless cafés, museums, galleries, shops, parks, and monuments. In Prague you will find an incredible blend of old and new, a rich history that is right before your eyes. Not only is Prague famously beautiful, it is also very safe. The Global Peace Index ranked the Czech Republic as the 6th safest country in the world in their 2016 report. The city of Prague provides an excellent environment to live in, to learn in, and to expand your horizons in. 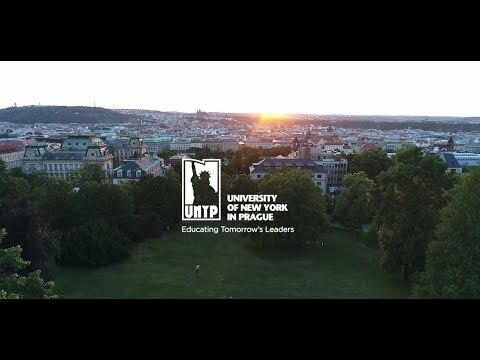 Best of all, UNYP is located right in the heart of this wonderful city! At UNYP, all of the classes are taught in English. Study alongside other UNYP and study abroad students in courses within Business Administration, Communication & Mass Media, International & Economic Relations, Psychology, and a wide range of courses in the social sciences, humanities, economics, finance, and arts. UNYP’s courses and degrees are accredited by American, Czech and British accreditation authorities. UNYP’s internationally diverse faculty is made up of 125 members from 25 different countries. With an overall student population of approximately 1,000 students from over 60 different countries, UNYP also boasts a very international student body. In addition, a 1:9 faculty to student ratio offers small class sizes to emphasize dynamic and engaged learning. Student clubs offer the opportunity to get involved outside of the classroom and to make an impact on the Czech community. UNYP’s campus is situated in Vinohrady - a quiet, upscale neighborhood in central Prague. Our facilities combine 19th-century architectural charm with 21st-century teaching and technology, and a full university administration is dedicated to supporting its students to the highest possible standard. Students who study abroad at UNYP jump right into this vibrant community, and the UNYP community welcomes them warmly. The University of New York in Prague has partnered with prominent real estate company Amres to be the very first private university in Prague to offer accommodation for its own students in the center of Prague. Belgicka Apartments consists of two freshly-renovated buildings located at Belgická 24 and 26 with a single entrance. The residence is centrally located in Prague’s Vinohrady neighborhood and only 100 meters from UNYP’s main campus on Londýnská, making it the most convenient housing option for our students. Each building has five floors with five apartments on each floor. There are 25 apartments on offer with a total capacity of more than 120 beds. Most of the apartments have their own balcony or small terrace. Belgicka Apartments gives students flexibility and choice in their living arrangements, including options to rent single or double rooms or even whole apartments. Each apartment is unique, enabling students to make their study and stay in Prague even more pleasant and comfortable. The area of the apartments vary as well as the size and the number of the single and double bedrooms (2 beds). In particular, it ranges for apartments from approx. 65 sq.m. to 130 sq.m and for the individual bedrooms from 10-12 sq.m (single rooms) to 13-27 sq.m. (double rooms) or 35-37 sq.m. (superior double rooms).